Highly likeable, would def recommend to friends. A qualified procedural dermatology specialist, Dr. Richard Torbeck attended the University of Toledo, where he earned his medical degree. Post this, he completed a residency in dermatology at Philadelphia University + Thomas Jefferson University. 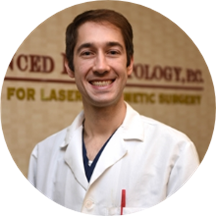 He is also fellowship trained in micrographic surgery and dermatologic oncology at the Icahn School of Medicine at Mount Sinai. Certified by the American Board of Dermatology, Dr. Torbeck is a zealous researcher, with authorial credits in numerous esteemed publications. He also holds active memberships in the American Society for Laser Medicine and Surgery, American Academy of Dermatology, and the American Society for Dermatologic Surgery. Dr. Torbeck is an accomplished and reliable dermatologist, catering to multiple locations across New York. Currently practicing at Advanced Dermatology PC, he focuses on a thorough and results-driven approach to skin care, utilizing the latest medical advances to gently lead the patient on the road to seamless recovery. His philosophy for skin care is simple: it should be easy, intelligent, and safe, and help you feel great not only on the outside but the inside as well. Dr. Torbeck was very personable. He addressed all of my concerns. My checkup was thorough.